FILE - Colombia's President Juan Manuel Santos. killed nearly a quarter million people, President Juan Manuel Santos told Reuters on Wednesday. In an interview Santos said he believes the leaders of the Revolutionary Armed Forces of Colombia, or FARC, will stick to their agreement to reach an accord within six months, but if the rebels break their word the center-right leader would not hesitate to return to the battlefield. 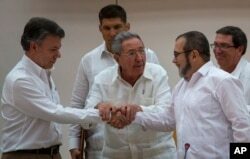 Last week, at a historic meeting in the Cuban capital Havana, the Colombian government and FARC leaders resolved one of the most significant hurdles to peace by agreeing to create special tribunals to try former combatants. The justice accord would apply not just to the FARC but also to government troops and right-wing paramilitary groups. Some critics, led by former President Alvaro Uribe, have said the deal amounts to impunity for criminals. Human Rights Watch also said the deal would deny justice to thousands of victims since ex-fighters who cooperate with the government would be able to avoid prison time. "Is this the price we are paying in terms of sacrificing some justice?" Santos said in an interview with Reuters Editor in Chief Stephen Adler. "Is it a reasonable price to pay? And the answer is, of course it is, by far. Because the alternative is to continue 30 more years of war." He said just a "small sector" of society has politically motivated reasons to oppose the peace deal and that millions of victims displaced by the conflict are more concerned about ensuring others do not suffer the same fate. The former defense minister said he was "absolutely convinced" that the FARC leaders were committed to peace. "You make peace with your enemies; you don't make peace with your friends. I sat down with the FARC because they are my enemies and I said let's make peace because it is good business for both of us." But, he added, "if I am convinced that they are again trying to play their games and not make peace I will stand up and continue the war." Santos said he was surprised by the cordiality of rebel leader Rodrigo Londono, known by his nom de guerre Timochenko, when they met for the first time last week in Cuba and shook hands. Previous negotiations have been derailed by ongoing violence. Some FARC units have formed an alliance with drug cartels exchanging protection for money. The drug-funded FARC has now agreed to help eradicate the illegal drug trade, a move that will help curb trafficking globally, Santos said. "The dividend for peace in Colombia goes way beyond Colombia's border," he said. The president did not directly answer a question about how much the implementation of a peace plan and the reconstruction of rural areas devastated by the war will cost. "The cost of peace is minimal," he said. "We will not spend beyond what we can spend compared to our income and to our revenues because we want to maintain the confidence of the international markets." The announcement of progress toward peace came on the heels of a visit by Pope Francis to Cuba where the religious leader called for the government and guerrillas to end their "long night" of war. At a meeting with the Pope in his private chambers several months ago, Santos said the Argentine pontiff told the Colombian leader he was praying for him more than any other person. "I said 'Oh my God, am I in trouble?" Santos joked, adding that the pope's support for the deal has been crucial.